Fight For Your Right To Write: Gather Round for a Literary Death Match… | Scots Whay Hae! “Each episode of this competitive, humour-centric reading series features a thrilling mix of four famous and emerging authors (all representing a literary publication, press or concern — online, in print or live) who perform their most electric writing in seven minutes or less before a lively audience and a panel of three all-star judges. After each pair of readings, the judges — focused on literary merit, performance and intangibles — take turns spouting hilarious, off-the-wall commentary about each story, then select their favourite to advance to the finals”. 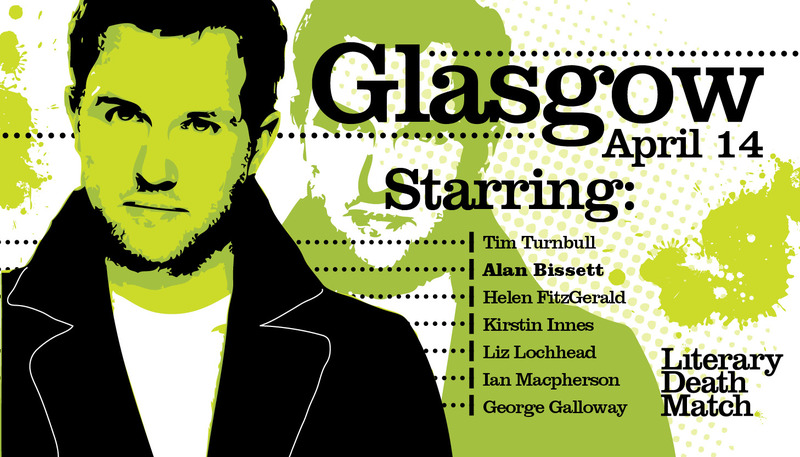 Alan Bissett is one of Scotland’s best novelists whose debut Boyracers has just had a 10 year anniversary release (10 years!!) He is also one of the most natural live performers around. Kirstin Innes is one of the people behind Words Per Minute, the excellent monthly live literary event that has found the perfect home at The Arches. Her first novel Fishnet is on the way. Helen Fitzgerald is an Australian born novelist who is often described as a crime writer but who is so much more. She has worked as a social worker in Glasgow’s infamous Barlinnie prison so has likely picked up a few tips. Tim Turnbull is a performance poet who also has experience of the ‘jugg’, working as writer in residence at HMP Castle Huntly. If you fancy checking out his work try his 2004 collection Caligula on Ice. Hopefully see you down The Arches. Doors open at 8pm and it all kicks off at 8.35pm. As a slightly excitable chap said to me in Rutherglen one day; ‘Bring yer mates and bring yer dinner’. To learn more about Literary Death Matches, and to see if they are coming to city near you, go to literarydeathmatch .